25th January is best known as Burns Night, when Scotsmen the world over celebrate their national poet, Robert Burns. But the same date is also significant in Wales, for a reason that goes much further back in time. St Dwynwen is the patron saint of lovers, and in Wales she is remembered on 25th January, which is St Dwynwen’s Day (or Dydd Santes Dwynwen). In effect, this date is really the Welsh equivalent of St Valentine’s Day. In the 5th Century, Dwynwen was the beautiful daughter of Brychan Brycheiniog, one of the kings of Brecon. Wales had lots of ‘kingdoms’ at that time, all ruled by warlike leaders keen to seize power over the entire land. According to legend, Dwynwen met and fell in love with a prince called Maelon Dafodrill (that is Dafodrill, not daffodil – although I must admit it’s a pleasing image). Maelon wanted to marry Dwynwen, but it was a star-crossed match: one story says that Dwynwen wished to become a nun, while another claims that her father refused his permission because he’d arranged for her to marry someone else. Because the story has been handed down verbally, there are lots of different versions, but they all agree that Maelon and Dwynwen had a dramatic falling-out. Dwynwen was so heartbroken that she begged God to make her forget Maelon. In a dream, she was visited by an angel who gave her a potion that would erase all memory of her love, and turn Maelon into a block of ice. His fate sounds a bit harsh, but let’s not argue with the druids. Dwynwen was then granted three wishes. Her first request was that Maelon be thawed out (her memory was obviously still intact). Secondly, she wished that God would fulfil the hopes and dreams of all true lovers; and thirdly, she vowed never to marry. 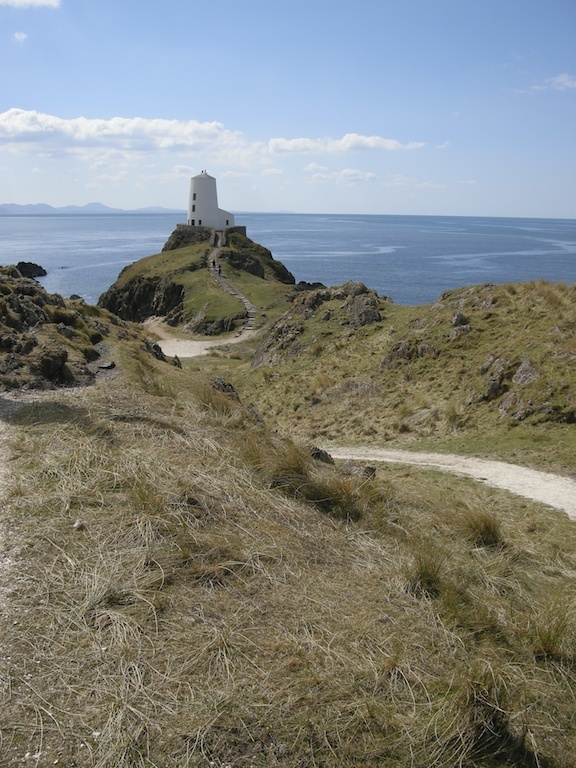 After this, Dwynwen retreated to Llanddwyn on the Isle of Anglesey, where she lived in seclusion and devoted her life to the worship of God. Llanddwyn (which means ‘Church of Ddwynwen’) is a windswept tidal island at the end of Newborough beach, with spectacular views out to sea. 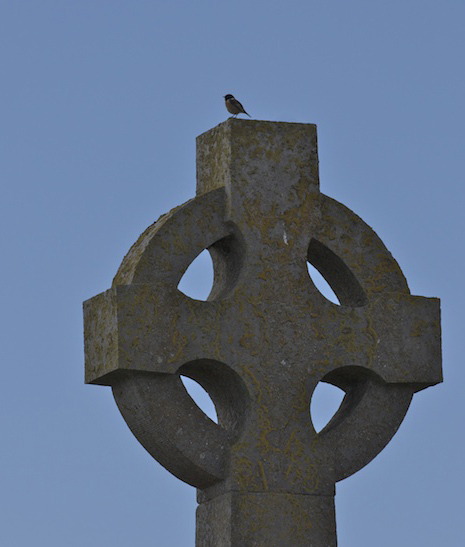 Following Dwynwen’s death in 465 AD, the island became a place of pilgrimage, and visitors would leave offerings at her shrine. 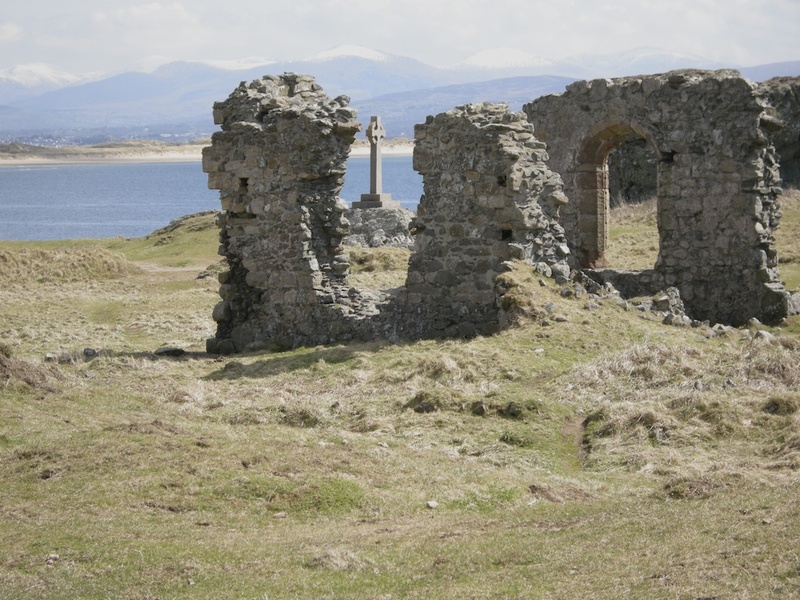 In the 16th century a church was built on the site of Dwynwen’s original chapel, and these are the remains that are visible today. The church consists of a relatively short nave, transepts and a relatively large chancel. The walls are of stone rubble with sandstone dressings. With the exception of a plinth on a fragment of the nave walling, the only detail preserved belongs to the chancel. Here the east and south windows are preserved, but lack their tracery. The cruciform plan is unusual in the region. The remains of a priest’s house are located about 50 metres to the south-west. Newborough is a National Nature reserve, and its sand dunes, mudflats and salt marshes support an abundance of flowers and wildlife. The whitewashed lighthouse, called Twr Mawr, marks the western entrance to the Menai Strait. It was constructed in 1845 to guide ships exporting slate from the ports of Bangor, Caernarfon and Felinheli. When we lived in North Wales, we often went for a bracing walk along Newborough’s wide sweep of sand. Most times we had the beach pretty much to ourselves, discounting the oystercatchers and black-backed gulls, and in good weather there were stunning views over to the mountains of Snowdonia. An old saying attributed to St Dwynwen is that ‘Nothing wins hearts like cheerfulness’. If she did indeed suffer such heartache, this is a remarkable testament to her spirit. Wonderful post – fantastic telling of her story and beautiful photos. You really have a wonderful blog! Thank you so much – and I’m really glad that you’re enjoying The Hazel Tree. Bravo – lets have as many people as possible promoting the proper patron saint day for lovers! This is such a wonderful post Jo…I love your history lessons and the photos you place with them. Thank you, David – it’s really good to know they’re being enjoyed! Superb history, Jo- and the images are great! Thank you! 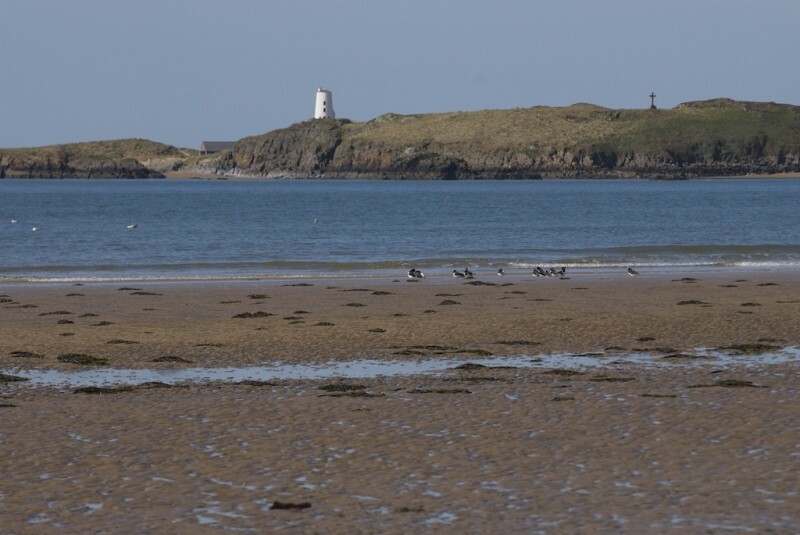 We used to love Newborough beach… I still miss many parts of North Wales.